BEECH GROVE—When considering how the seeds of his vocation to the priesthood may have been planted, retired Father Gerald Burkert recalled an incident in the first grade at the former Sacred Heart School in Indianapolis. After finishing the eighth grade at Sacred Heart, Father Burkert became an archdiocesan seminarian in 1949 and began his formation as a high school freshman at Saint Meinrad Seminary in St. Meinrad. 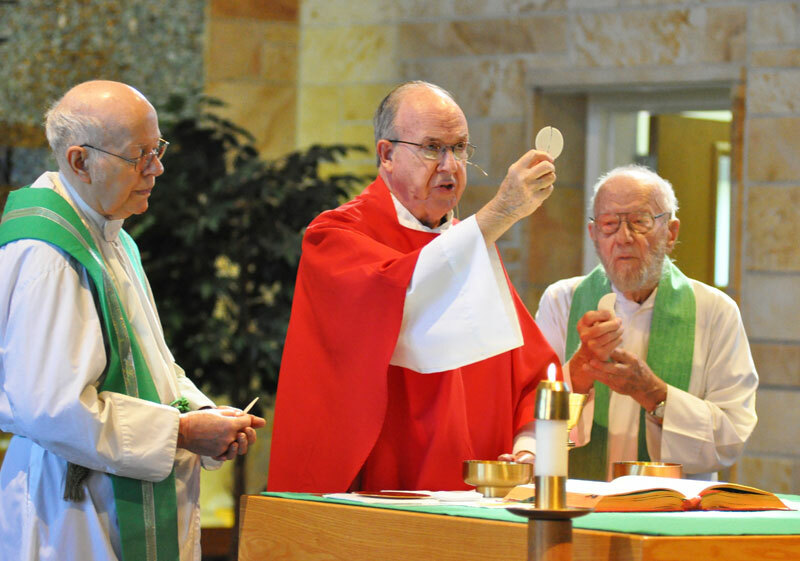 He was ordained 50 years ago, and celebrated his golden jubilee with gatherings of family members, friends and former parishioners at St. Paul Hermitage in Beech Grove, where he currently resides and serves as chaplain, and at Holy Family Parish in New Albany, where he ministered as pastor from 1983-96. Father Burkert was ordained a year before the start of the Second Vatican Council. So the early years of his life and ministry as a priest were marked by adjusting to the reforms that happened during and after the council. During much of that time, Father Burkert served as assistant pastor of St. Jude Parish in Indianapolis, ministering with the pastor at the time, Father William Morley. After spending two years as assistant pastor of St. Mary Parish in New Albany, Father Burkert returned to St. Jude Parish and served as co-pastor with Father Morley from 1971-83. In all, he ministered alongside Father Morley, who died in 1985, for 19 years. After serving as co-pastor of St. Jude Parish, Father Burkert returned to New Albany as pastor of Holy Family Parish. His last assignment before he retired in 2007 was as pastor of Holy Name of Jesus Parish in Beech Grove. In all of these parishes, he helped lead the parishioners in making physical improvements to their facilities. While leading parishioners in projects like adding on to schools was important to Father Burkert, celebrating the sacraments, especially the Eucharist and reconciliation, were essential to him in his parish ministry. When taking a break from parish ministry, Father Burkert loved to travel. He often vacationed with a priest friend, the late Father Patrick Commons. One of his favorite destinations, with its beautiful mountaintop views, was Glacier National Park in Montana. After retiring in 2007, he hoped to do more traveling. But just months after stepping down as Holy Name’s pastor, Father Burkert suffered a stroke while alone at his apartment in Indianapolis. Father Burkert recovered from the stroke, but soon moved to St. Paul Hermitage retirement and nursing home. As its chaplain, he regularly celebrates Mass at its chapel and ministers to fellow residents. Because of the ongoing effects of the stroke, Father Burkert isn’t able to drive to parishes on weekends to provide sacramental assistance. After living and ministering as a priest for 50 years, Father Burkert’s advice to men considering a possible priestly vocation is clear and to the point.